Once upon a long ago, mining companies were major contributors to the working and social life of remote and regional Australia. Not any more. Mining companies are major destroyers of working conditions and social fabric in remote and regional Australia. Miss Eagle is now living in her third mining town and her second gold town. First was the company town of Mount Isa - 1997-86. A great place to be when it was owned by Mount Isa Mines. True, there was a colourful past involving the eight month long strike in 1964 and the consequent declaration of a State of Emergency. Then there was Tennant Creek from 1993 to 1997. TC likes to bill itself as the site of the last gold rush in Australia. Miss Eagle was there when the last of the major mining corporates closed down. But there is always hope in the heart of a mining and there are always prospectors and geologists and there are smaller 'shows' around the Tennant these days. And now Ballarat since 2012 - home to the beginnings of Australian democracy with the events surrounding Eureka and the ensuing lives of its proponents - and now finding itself, through a freeway and a good rail service, almost a western suburb of Melbourne with mining still going on below the cities streets. Mining has been a major component in the history of Australia: enriching the nation's economy; building strong social cultures; contributing to a strong union movement - particular through two major unions: the Australian Workers Union, and the CFMEU. All this rich history has now been superceded by what is, arguably, a sterile social and working culture imported from that place of many poor working conditions, the USA. It is called, FIFO. There is no building of community and social fabric. Such tolerance of unions that may have existed and which was embedded in the community life of mining towns as dissipated. Mining companies return more to their international shareholders than they do to the communities or states surrounding the mine sites from which they are extracting riches and leaving behind dubious environmental legacies. In some cases, such as Moura and Moranbah in Queensland there has a risen a sharp contrast between the old mining culture and the new - and, as it works itself out, never the twain shall meet. This has a huge impact on the commercial hearts of the old mining towns. The new mining ventures are full of single people, not families. The employees of the new mining ventures shop elsewhere - except perhaps for those who go to local pubs, clubs and bars. And now the question is - how long will the old mining towns last. There is nothing new about mining towns being swallowed up by the dust of history as the riches have been exhausted. An example of this is Mary Kathleen in north-west Queensland which had a life of approximately thirty years. But running out of resource is one thing. 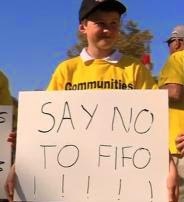 Chewing up, swallowing, and then spitting out human labour, creativity and capital is another - and that is what FIFO is doing. That is one story. Now there is another. Huge environmental destruction - of the Galilee Basin and the Great Barrier Reef and its environs. It seems that where once a community might have become united as it strove for better wages and safer working conditions, now the community becomes united against the environmental mess and destruction which is being thrust upon them. The recently elected Queensland Labor Government is fulfilling its election promise of a FIFO inquiry. The Inquiry is being led by Jim Pearce a former miner. The terms of reference for the Inquiry are here. As well, they are published below. Submissions MUST be in by 25 May. 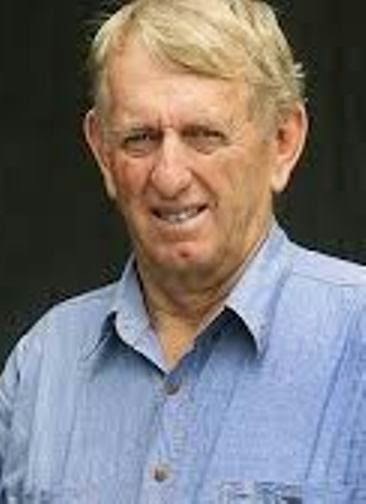 As if this is not sufficiently controversial, Pearce spoke in the Queensland Parliament this week of the exploitative work practices of the mining companies - causing even more furore. To read what Pearce said in Parliament, please go here. who emailed the Pearce speech and set off this post. The inquiry was referred to the committee by the Legislative Assembly on 27 March 2015. 1. Inquire into and report on fly-in, fly-out (FIFO) and other long distance commuting work practices in regional Queensland. 3. Further, that the committee seek public submissions and consult with key stakeholders including local communities, resource companies, unions and local government. 4. Further, that the committee report to the Legislative Assembly by 30 September 2015. The Committee invites submissions addressing the terms of reference, from all interested parties. Guidelines for making a submission to a parliamentary committee are available here: Guide to making a submission.